Global equity markets suffered their worst weekly returns since March. As investors favored their relative safety, yields on the 10-year Treasury note declined. A burgeoning trade war hampered consumer sentiment which unexpectedly declined to 99. The S&P 500 Index dropped nearly 4.1% during the period, as each of the eleven underlying sectors turned in negative results. The benchmark index has now logged three consecutive weekly losses, its longest since June 2016. 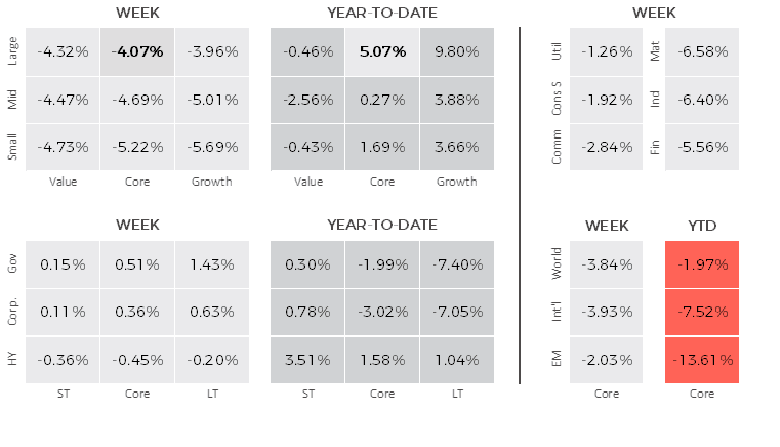 Large cap stocks outperformed small cap and value generally bested their growth brethren across the market capitalization spectrum. Utilities, consumer staples and communication services stocks led the way, while materials, industrials and financials stocks lagged. Rising Treasury bond yields, the deepening U.S. trade conflict with China, signs of weakness in the global economy, and other concerns continued to weigh on sentiment during the week. Developed non-U.S. markets struggled during the period, with the MSCI EAFE Index falling 3.9%. European markets fared the worst, as Italy continued its standoff with the EU. At current, the spread between yields on 10-year Italian and German bonds, seen as a gauge of financial strain, closed near its highest level since 2013. Emerging markets, as measured by the MSCI Emerging Markets Index, turned in the best relative results with a 2.0% decline. The Latin America region, as measured by the MSCI Latin America Index, turned in a positive result during the period, up 1.0% as investors in Brazil cheered the victory of far-right candidate Jair Bolsonaro of the Social Liberal Party, who nearly won the presidency in Sunday’s first round of voting. The sell-off in equities seemed to push some investors into the bond market, and longer-term bond yields decreased for the week. The yield on the benchmark 10-year Treasury dropped from 3.23% at the end of trading the previous week to 3.15% at the close Friday. The drop in yields during the holiday shortened trading period, pushed bond prices higher, especially for longer-term Treasuries that are particularly sensitive to interest rate changes. The focus will be on corporate fundamentals this week as more U.S. companies report third-quarter earnings. Expectations for this earnings season are high with FactSet expecting earnings to grow by 19%.